Tell us: Where should Made in America go? The Chainsmokers perform on the Rocky stage during the Budweiser Made In America festival on the Ben Franklin Parkway in Philadelphia on Sept. 3, 2017. What will become of Made in America? Jay-Z and Mayor Kenney are engaged in a public spat over the future of the two-day-long festival that's been attracting thousands to the Benjamin Franklin Parkway since its inception in 2012. Kenney's administration is pushing Made in America away from the Parkway — a bit of information that came as a surprise to Jay-Z, the mogul's own Roc Nation as well as Live Nation, the festival's organizer, after it was first reported by news outlet Billy Penn. Sarah Reyes, deputy communications director for the mayor's office, confirmed that the 2018 celebration, featuring Nicki Minaj, Meek Mill, Post Malone and Diplo, will be the "last year MIA will be held on the Parkway." However, she said "the city is interested in discussing alternate locations within Philadelphia for future years" and Mayor Kenney on Wednesday left open the possibility that the event could ultimately remain on the Parkway. So if Made in America continues to be a part of Philadelphia's Labor Day weekend festivities, where should it take place? Here are a few potential but unofficial locations (some mentioned in a report on Parkway use from earlier this year), or feel free to throw in your own ideas. Send us your opinions through the Google form below, or send an email at pmadej@phillynews.com. We may publish your name and response in a roundup of the answers we received. Here's more information on potential locations for the festival — why it's been held on the Parkway for so long, and where else it could go. Fans wave their arms while Maleek Berry performs at the Tidal Stage during Made In America along the Benjamin Franklin Parkway in 2017. 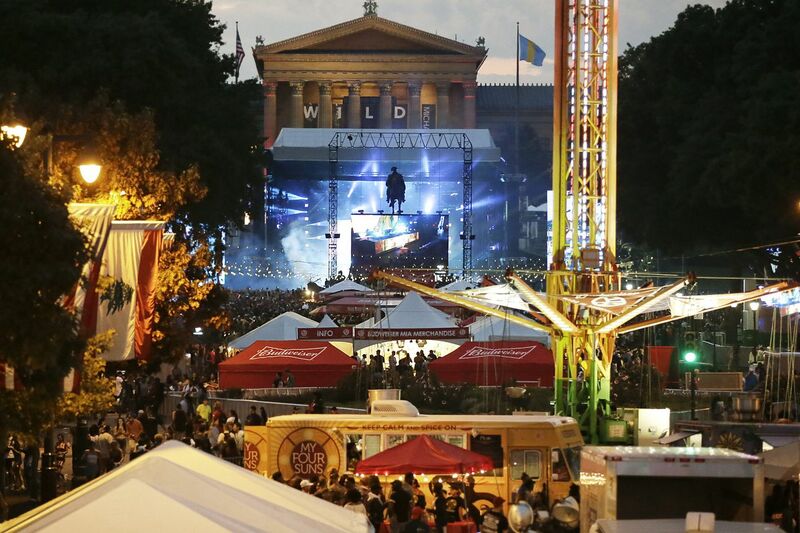 The Parkway's played host to some of Philadelphia's largest events including Pope Francis' 2015 Mass, the 2017 NFL Draft, part of this year's Eagles Super Bowl victory parade and the annual Wawa Welcome America concert on July Fourth. The location, however, has faced criticism and noise complaints from neighborhood residents. Parking in the immediate area is limited, and public transit isn't as accessible as it is to other major venues, like the sports stadiums. "When the festival first started, it was intended to provide a unique attraction to the city on the otherwise quiet Labor Day weekend," Reyes said in a statement. "Over the years, tourism has grown overall, and the need for an event of this scale at this location may no longer be necessary." Black Thought (wearing ballcap) performs during the 11th annual Roots Picnic at Festival Pier on June 2, 2018. The Festival Pier at Penn's Landing is no stranger to large-scale events, including the Roots Picnic and Daryl Hall and John Oates' Hoagie Nation Festival. The location offers great waterfront views, is easily accessible by SEPTA, and is close to other tourist attractions in Old City. The crowd waits for the Tchaikovsky Spectacular with the Philadelphia Orchestra and fireworks at the Mann Center for the Performing Arts in Philadelphia on July 19, 2017. The outdoor music venue is nestled in Fairmount Park and offers gorgeous skyline views. While it is located further away from residential neighborhoods than other locations, it may not be as easy to get to without a car. On-site parking is a plus, however. Jay-Z performs at the Wells Fargo Center on Dec. 1, 2017. Home to Philadelphia sports events and larger concerts — Jay-Z and Beyonce will perform at Lincoln Financial Field as part of their On The Run II tour at the end of the month — the South Philadelphia stadiums have plenty of on-site parking and are just a ride away on SEPTA's Broad Street Line. The Maine performing at the final cross-country Warped Tour at BB&T Pavilion in Camden earlier this month. The outdoor amphitheater/indoor theater venue already hosts some events as part of 88.5 WXPN's XPoNential Music Festival and is a stone's throw from Philadelphia. But, that may be part of the problem — it's just not in Philadelphia. A group of employees from URBN and Revzilla enjoy their lunch outside of Building 543 at the Navy Yard Corporate Center in Philadelphia’s Navy Yard. The large commercial area hosts events including the Philly Craft Beer Festival and is the ending point for the annual Broad Street Run. It too is accessible via the Broad Street Line and Navy Yard Shuttle. Jay-Z didn't mince words in a scathing op-ed to the Inquirer and Daily News, writing that organizers were "disappointed that the mayor of the City of Philadelphia would evict us from the heart of the city, through a media outlet, without a sit-down meeting, notice, dialogue, or proper communication." He wrote that the move "signifies zero appreciation for what Made in America has built." Kenney addressed the heated debate at a news conference Wednesday, saying that he loved Jay-Z and wanted Philadelphia to keep the festival, but the event had "operational difficulties." Kenney left open the possibility of Made in America staying on the Parkway.